+ I recently listened to an interview with Jessi Connolly of Naptime Diaries on the God Centered Mom podcast, and I definitely recommend that everyone give it a listen. Her honesty and genuine heart for God are both beautiful and refreshing—also, she shared a lot of her story that I wasn't aware of, and it was definitely a reality check for me. I tend to look at these beautiful women online who have beautiful lives and beautiful families and assume it all came so easy to them, rarely thinking about the rest of their story that can't be shown in a blog post or on Instagram. Jessi's transparency and encouragement are things we all could use a touch of, so give it a listen if you have a chance this week! + Speaking of Mother's Day (because all of these bullet points seem to be unintentionally relating to one another), I've come across some adorable things around the ol' internet and wanted to share a few of my favorites: Mini Scripture Cards from The Hipster Housewife, Custom Family iPhone Case from My Little Buffalo, Best Mom Ever Tea Towel from Nesta Home, Braver/Beautiful/Stronger/Loved Dessert Plates from DaySpring, and this Bamboo Glass Waterbottle from Orla Kiely for Target. 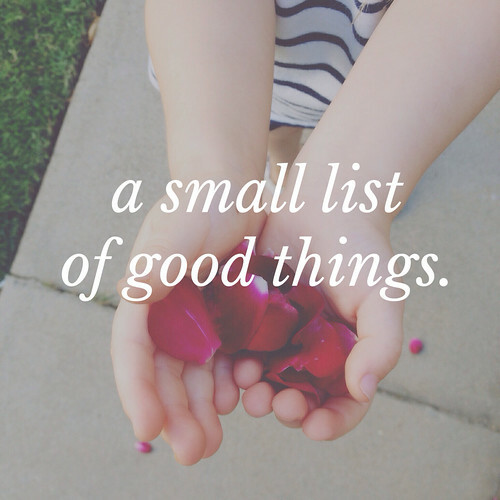 Are there any pretty things you're keeping in mind for your own mama (or mama-in-law)? + I've been purposely avoiding Pinterest lately (both for productivity and for my own peace of mind! ), but during the past couple weeks the following pins have caught my eye: soft and chewy peanut butter crinkle cookies, easy pancake bites, DIY portable LEGO kit, and oh, my gosh, the cuteness of this photo is even more than I can handle right now. + This past weekend, I was running around doing some errands while Eisley actually napped, and as I was browsing the cereal options at CVS, a girl who couldn't have been older than 11 or 12 walked by and (noticing my ever growing belly) sweetly said, "Congratulations!" as she walked by. It really made me smile, especially for a girl that age to think to say something like that to a complete stranger. Such a sweet moment. And now it's your turn! I'd love for you to share any good things (or good moments!) you've come across lately. Love your Mother's Day ideas, so cute!